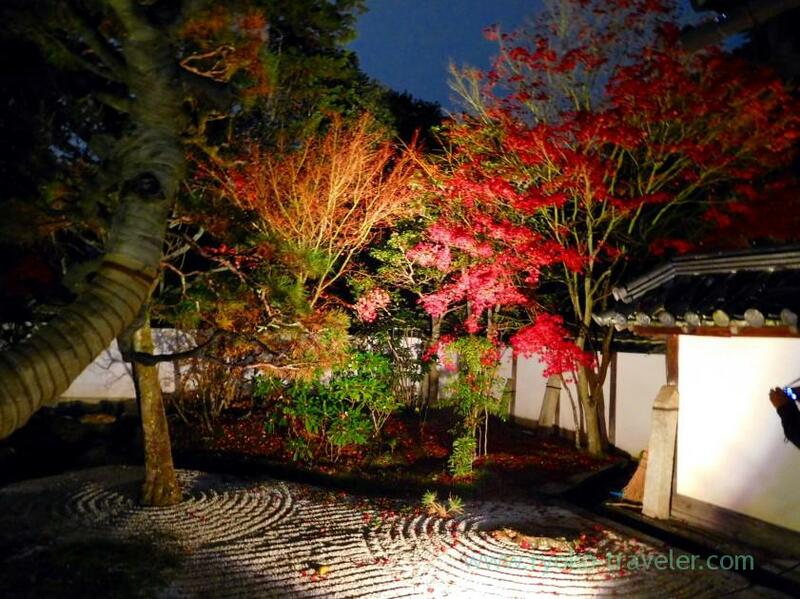 Beautiful garden with red leaves. 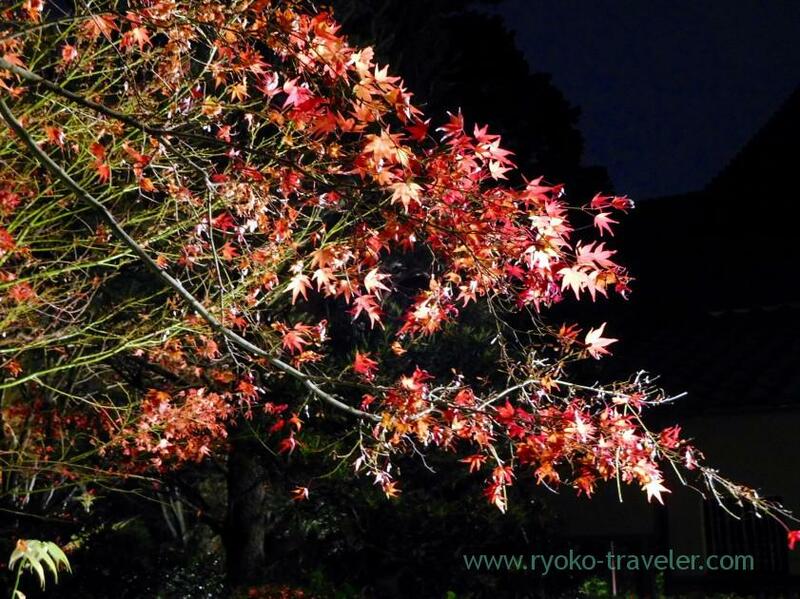 I visited Kyoto for viewing autumn leaves last weekend. 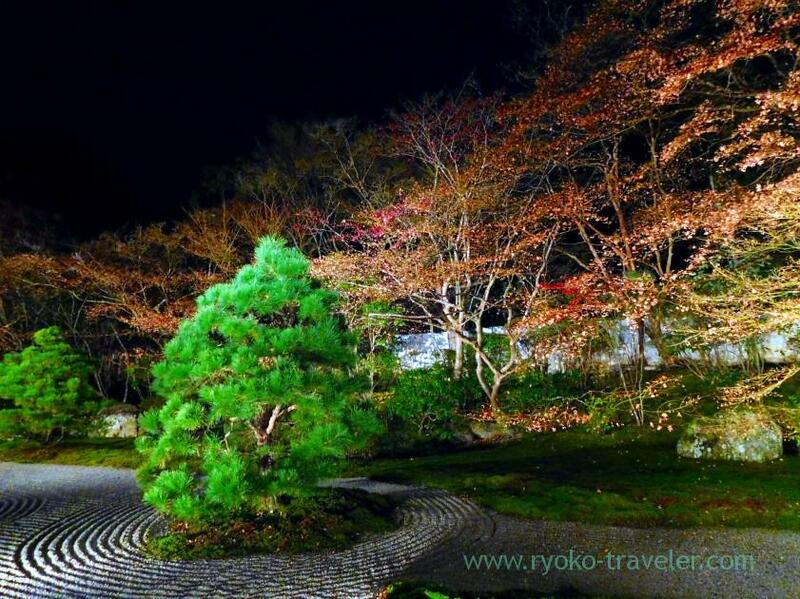 Though unfortunately it rained throughout the weekend, Autumn leaves were enough beautiful. 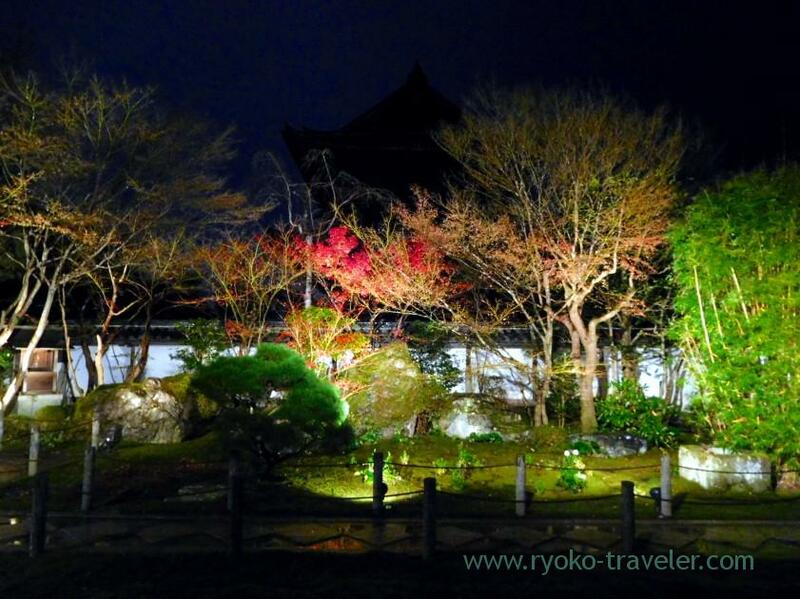 Some temple are open in special during Autumn leaves season.We can see brilliant light-up Autumn leaves. So, I visited one of the temple on the first day. 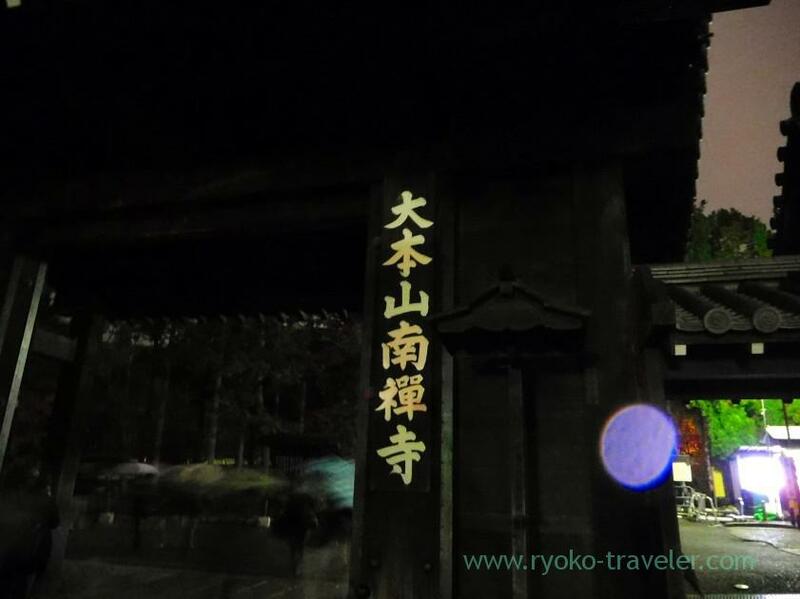 I got to Keage subway station around 7 p.m. Keage station is close to Nanzenji temple and Eikando temple. 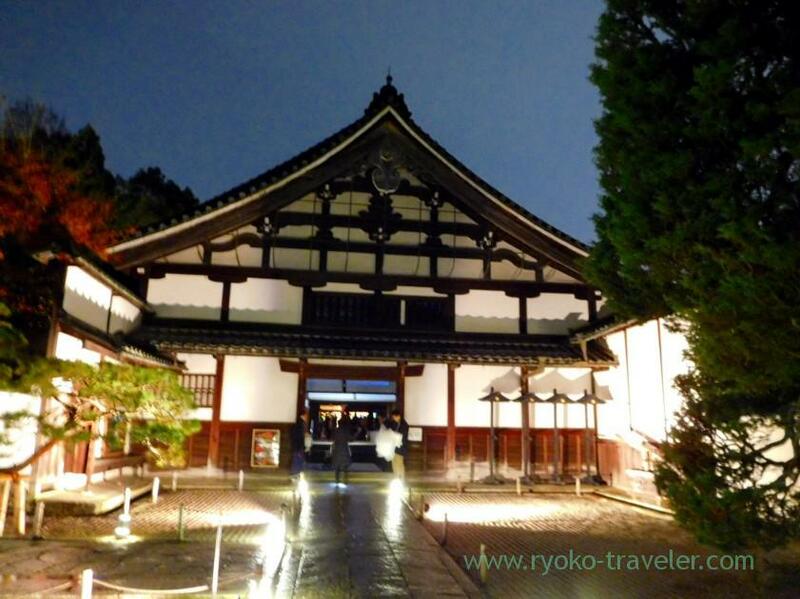 Yes, my target was Nanzenji temple (南禅寺). 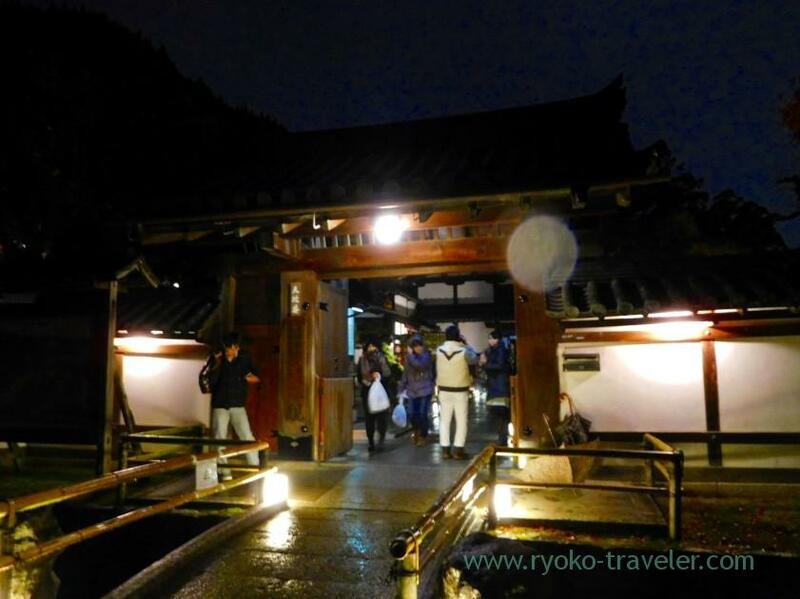 Nanzenji temple’s special Autumn night show was held from November 15th to 30th. 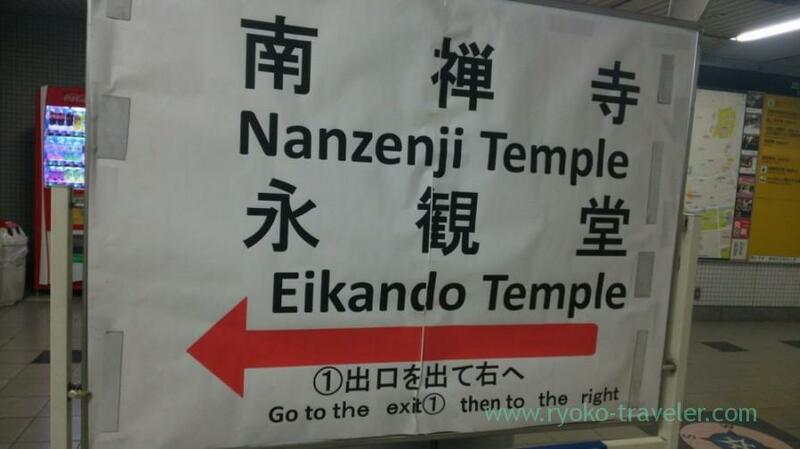 About 10 minutes walk slowly brought me to the temple from the station. There’s such a sign in front of the ticket gate in Keage station. So, I followed the sign and went toward Gate 1. 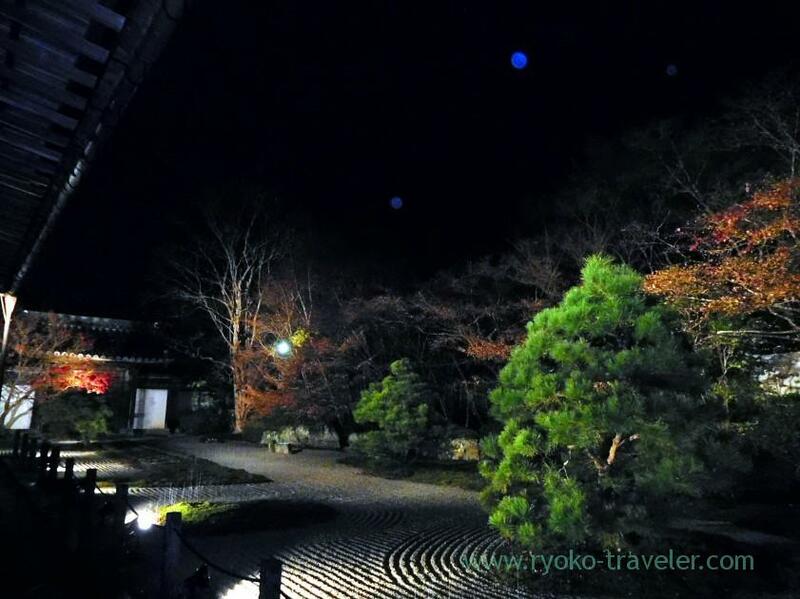 The special night view was held in Tenjyuan temple that is one of the sub-temple of Nanzenji temple. When I got to there past 7 p.m., there were already about 30 people in front of the gate in line. They were limiting the number of admissions. I waited for 20 minutes or so, and then finally I got a ticket and entered the temple. 500 yen is fee for daytime. 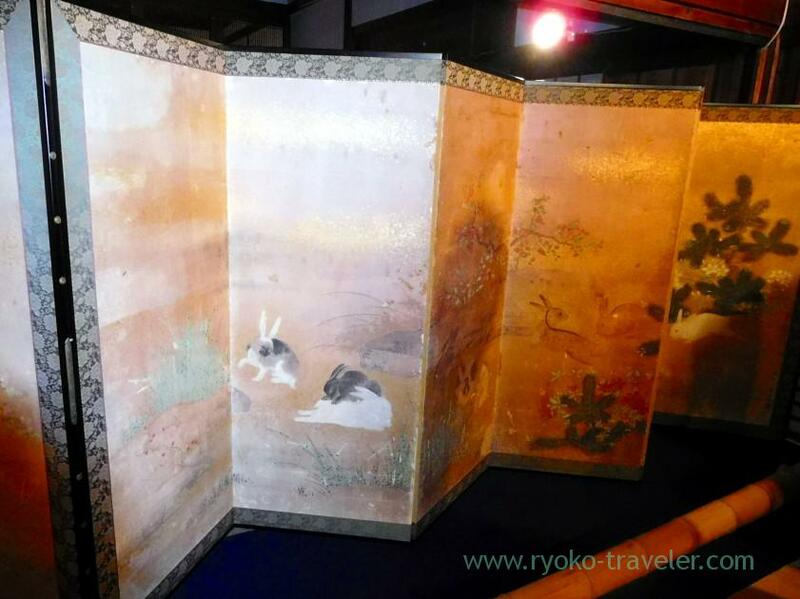 But special night fee is 600 yen. 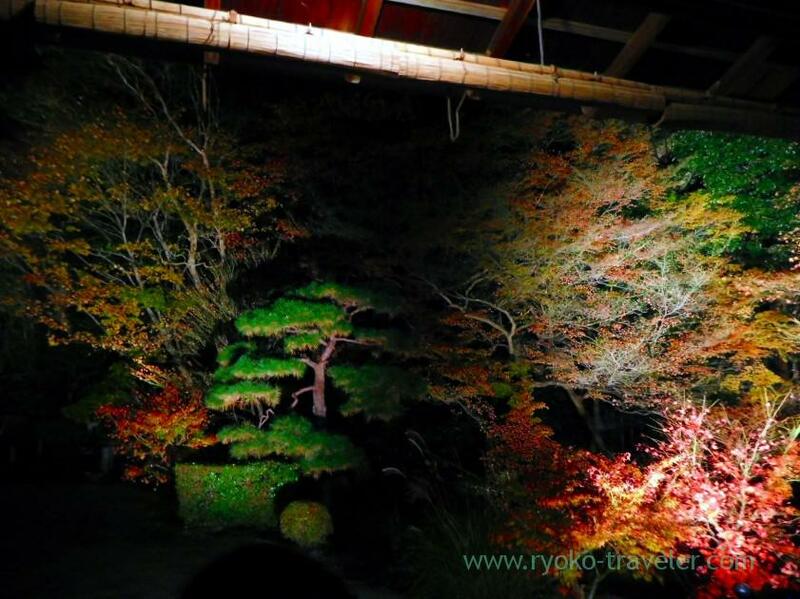 We can see beautiful garden from inside the hall. There were so many people in the hall. It was dark in the house and the garden was grow. 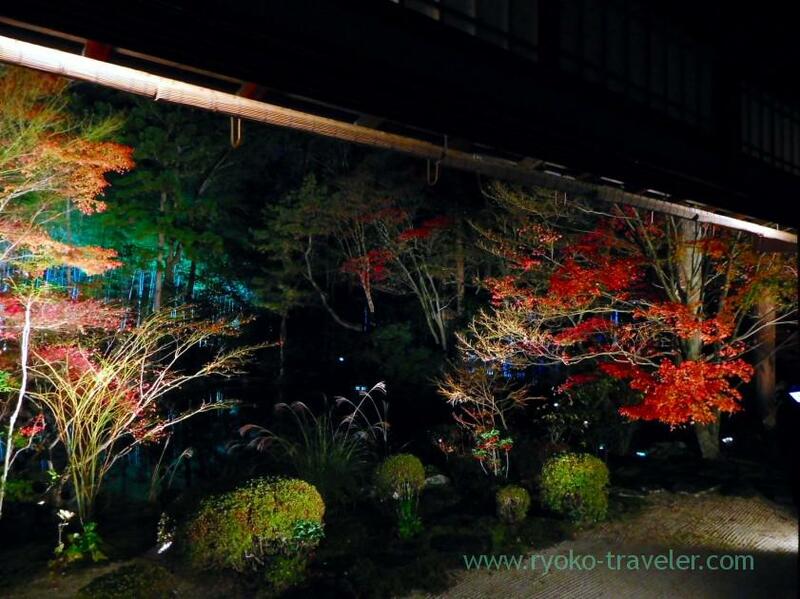 Though Autumn leaves were already pass their peak, still it was beautiful thanks to the light-up. Such a picture was shown during the special nights. 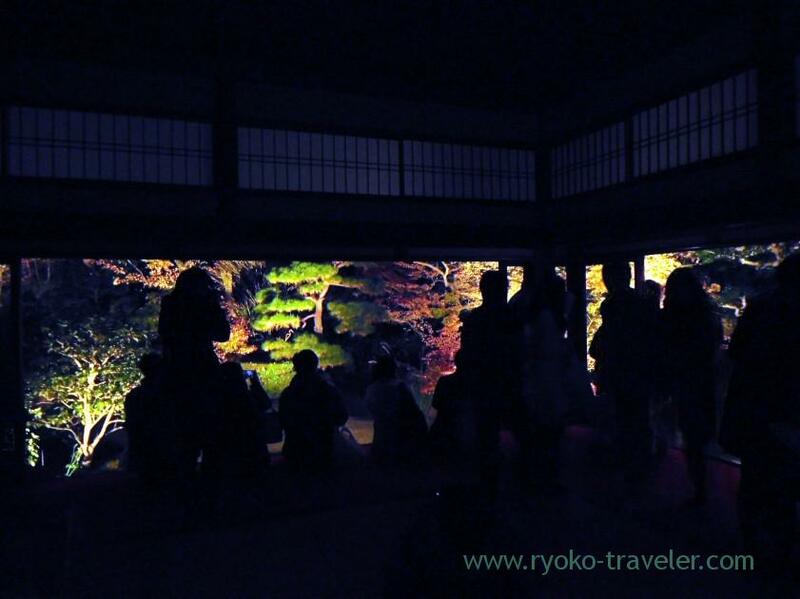 But many people didn’t see it because the beautiful scenery captivated many people.